According to city officials, 50 per cent of trips in Vancouver are now taken by foot, bike, or public transit. 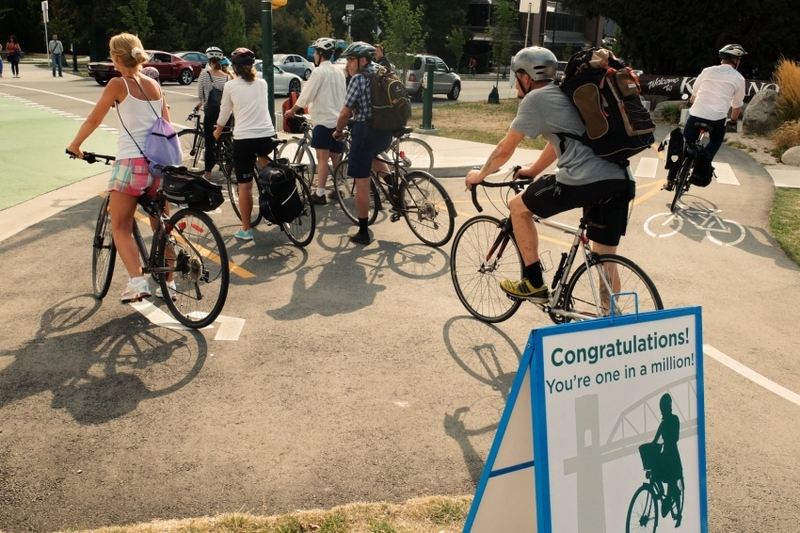 Cyclists celebrate a major biking milestone at the Burrard Bridge near Cornwall Avenue. Photo by Ken Ohrn, Cypress Digital. Any minute now the bike counter at Burrard Bridge and Cornwall Avenue will hit seven digits, marking one million cycling trips over the bridge since the start of 2015. 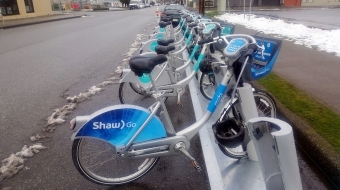 It's a major milestone for the City of Vancouver, which installed the unit in January to track the community's growing interest in two-wheeled transit. According to municipal statistics, 50 per cent of all trips in the city are now taken by foot, bike, or public transit, and use of bike lanes has increased every year due to greater investment in cycling infrastructure. The one million-mark not only validates these investments, said local group HUB Cycling, but proves Vancouver residents' commitment to going green with their mode of transportation. “It takes bold leadership," said Colin Stein, HUB's director of marketing, communications and campaigns. "It’s one thing to talk about being green or design sustainable solutions, but actually implementing them... it takes dedication." Stein, a self-proclaimed cycling enthusiast, has been checking on the meter regularly and said yesterday, the number of cycling trips stood at roughly 990,000. He'll return to the counter again tonight to see if it the numbers have rolled up to one million. The bike counter is expected to roll over the one million-mark either late Friday evening or early Saturday morning. Photo by Ken Ohrn, Cypress Digital. “It’s amazing," he said of the milestone. "It’s somewhat hard to comprehend, and yet for anybody like myself who used to live in Kitsilano or still does, the idea of a million people going over the bridge by bike is just something that now you can fully envision and appreciate." In 2009, satellite news trucks gathered at the Burrard Bridge to document the fiasco surrounding the city's decision to convert a driving lane into a separated bike lane. The move was controversial at the time, but after a successful trial run, the lane was made a permanent feature in 2010. Cycling traffic over the bridge has increased steadily since then, and according to the city, the weekend average in June rose from 4,200 trips in 2014 to 6,600 trips in 2015, and the weekday average rose from 5,500 trips in 2014 to 6,400 in 2015. Stein now hopes celebration of the bridge's one millionth bike ride will prompt further investment in cycling infrastructure elsewhere in the city.